“Natural killer (NK) cells were first discovered for their ability to kill tumor cells, and later found to also kill pathogen-infected cells. Different tissue-resident subpopulations of human NK cells exist throughout the body, displaying unique phenotypic and functional properties. 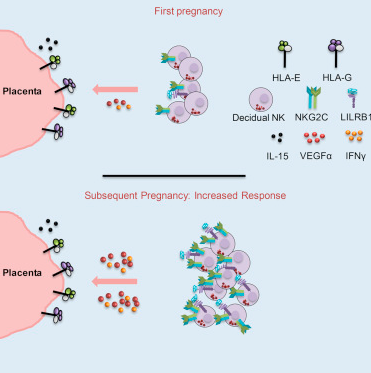 One of the most fascinating tissue-resident subsets of NK cells, termed decidual NK cells, is found at the maternal fetal interface (decidua) in direct contact with the placenta. We discovered a population found in repeated pregnancies, which has a unique transcriptome and epigenetic signature..have open chromatin around the enhancers of [growth factor genes] IFNG [essential for angiogenesis] and VEGFA [supporting vascular formation].